Don’t answer that email! OK, fine, you can answer it, but then it’s time to start thinking about your next getaway. We know there’s no “play hard” without the “work hard” that comes before it, but we didn’t make up the facts about how time off is just plain good for you. That’s just science. So tell your boss #sorrynotsorry and use that annual leave in a massive way: book a Daintree treehouse getaway on lastminute.com.au. Forget adulting. Eco-friendly treehouses are the perfect escape to indulge your inner child while sticking to your principles. Your accommodation will quite literally blend in with the landscape, but everything else about this holiday is sure to stand out. Where else will you find tree branches growing through your living room? (Hopefully not in your flat!) You’ll have so many crazy stories in Daintree, your friends will definitely be texting “pics or it didn’t happen”. When you’re all secluded and cosy in your treehouse, you’ll go from FOMO to JOMO in no time (that’s the Joy Of Missing Out, in case you didn’t know). That’s because with Daintree treetop accommodation on a budget, you get the most selfie opportunities per dollar spent. Inside, your treehouse has the rugged good looks of a Hemsworth brother. 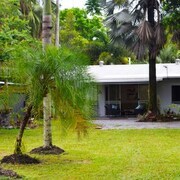 Outside, Daintree provides scenery so gorg, well, it’s also sort of like a Hemsworth brother. “I really wish I had stayed somewhere boring and expensive”, said no one ever. 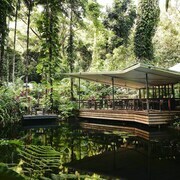 Luckily, some mad genius built cheap treehouse cabins in Daintree, and you can book them right here on lastminute.com.au. We should warn you: It’s so easy, you’ll want to stay in the trees every time you travel. 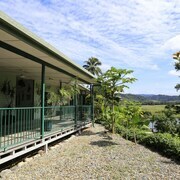 Great location and very child friendly Stayed for 2 nights over the long weekend, service was exemplary. I took my little boy and he was made to feel very welcome, unlike other b&bs that don't allow kids. The resident bandicoot is gorgeous, my son enjoyed feeding it.